TNS MySurvey Canada offers its members the opportunity to earn points for completing surveys, registering as a new member, and also for referring other members. The number of points allocated for every online survey a member takes is stated in the survey invitation e-mail they receive. 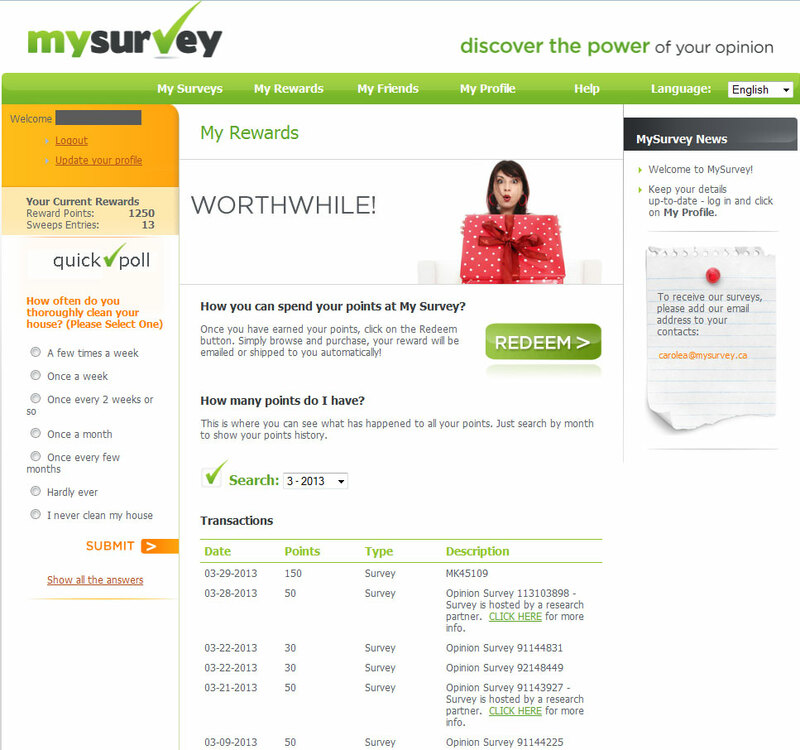 You can earn between 10-500 points for every survey you successfully complete. Once you have at least 1110 points in your account, you can redeem your points different rewards. These include a PayPal cash payment, gift certificates, or a charitable donation. If you get screened out of a survey, you will automatically receive an entry into the monthly draw where 10 winners will win 10,000 points. Once you’ve reached the low minimum cashout level of 1,142 points (the equivalent of $10.00), you can redeem your points for a PayPal cash payment made directly to your account. If you’d prefer to receive a gift card you can select one from retailers including Amazon, Canadian Tire, Boston Pizza, Aldo, Payless Shoes, the Olive Garden, and many more. Some gift cards will be mailed to you, others will be in electronic format. If you’d like to make a charitable donation, you can donate to Unicef or the Canadian Red Cross. There are over 100 reward options in total to choose from the product catalogue including jewelry, small kitchen appliances, electronics, and more. Every month, 10 lucky winners are randomly selected to receive 10,000 points just for being an active survey taker. For certain surveys completed, you will receive an entry into this sweepstakes; the more surveys you complete, the better your chances of winning. Each prize is worth around $100. Earn 5 bonus entries each month, just for being a member. Not only can you earn points by completing surveys, by referring friends to the panel and participating in focus groups, product tests and online community opportunities, you can earn more. When you refer a friend and they take the First Chance Survey, you’ll earn 150 reward points credited to your account. On average, you will receive an invitation to complete an online survey every one to two weeks. This frequency can vary on the type of studies available and how they match up to your demographic information. My Survey offers the occasional product testing assignment. Although these aren’t offered regularly, the longer you are a member and take surveys, the more likely you will be selected to complete a future product test. Helpful Tip! Keep your details up-to-date and qualify to receive more surveys. Log in to your account and click on My Profile. 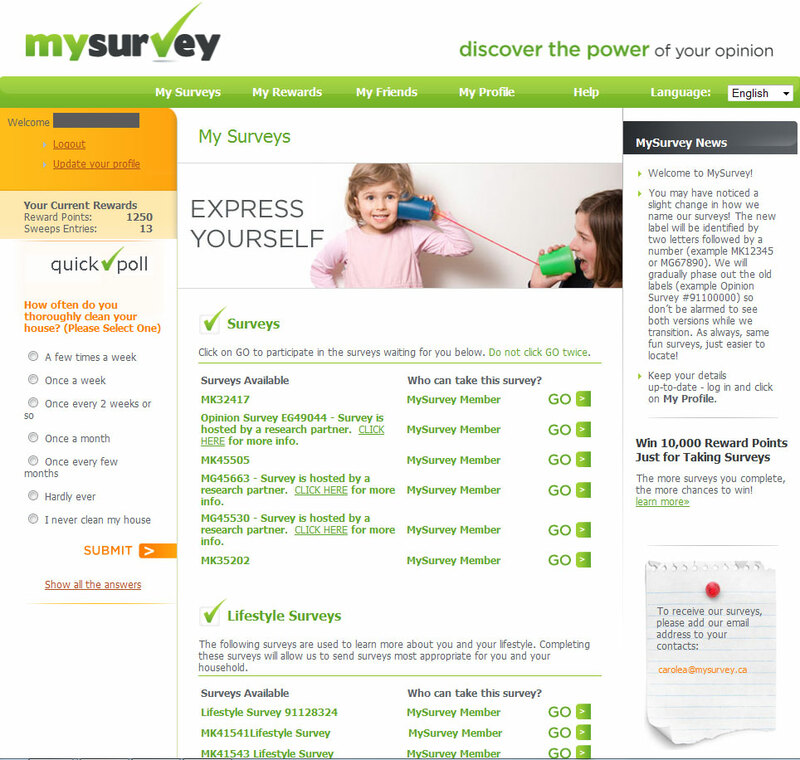 My Survey Canada is one of Canada’s largest market research online communities. Founded in 1932 as “Canadian Facts”, it was established as Canada’s first survey research organization. Today it has offices in four cities across Canada and employs over 150 people. TNS MySurvey Canada is a TNS company which makes it part of the world’s largest provider of internet-based custom marketing research. TNS provides market research analysis and insight in over 110 countries! To get started with TNS My Survey Canada is very simple: fill out the registration form, confirm your registration by clicking on the link in the confirmation e-mail and you will be contacted via e-mail every time an online survey is available for you to complete. The survey invitation e-mail will tell you the topic of the survey, approximately how long it will take you to complete as well as how many points you will earn for completing the survey.